Many years ago, the World was quite different from today. The gods lived in Heaven, while the Earth was ruled by humans, demons and monkeys. In the forests there were wise hermits and strange animals, and in the sea lived the beautiful mermaids. In the skies there were magical creatures, and under the ground lived the royal serpents, the nagas. There were two beautiful towns. One was Ayudhya, built by Visanukam at the command of Shiva. It was inhabited by humans and ruled by King Tosarot. Another was Lanka, built by Brahma in the middle of an island. This was the main town of the demons. Ravana was the demon king of Lanka. He had many arms and multiple heads. He was immortal, because his soul had been removed from his body and was kept in a glass shrine, so that nobody could kill him. He went about disguised as Indra and seduced many of the goddesses. He had one thousand children with his wives, and two sons with a female elephant. The demons became gradually more aggressive and powerful, and it became difficult to preserve the peace. The gods held a council and decided that Narayana, an incarnation of Vishnu, needed to be re-born on Earth to restore the balance. So Narayana was re-born as Prince Rama of Ayudhya. His consort, Lakshami, was re-born as a princess of Lanka. At her birth, she cried out ill omens for Lanka and all demons, so it was decided to place her in a glass bowl and send her down the river. She was found by a hermit, Janaka, who gave her the name Sita and brought her up. The hermit was the former king of Mithila. When he realised the beauty of his adopted daughter, he went back to his kingdom and ruled as before. Rama had a younger brother, Lakshaman, and two younger half-brothers, Barata and Satru. They were close friends. All four were educated by famous hermits, and each one was given three destructive weapons by Shiva. The fathers of Rama and Sita, King Tosarot of Ayudhya and King Janaka of Mithila, agreed to engage the young couple in marriage, and Rama and Sita lived happily for a while. Kaiyakesi was the second wife of King Tosarot of Ayudhya, and the step-mother of Rama and the mother of his half-brothers. King Tosarot, when they were young, had promised her to fulfil any of her wishes. Now she wished that her son Barata should rule as a king for fourteen years before Rama, the elder brother, could ascend to the throne. King Tosarot became very unhappy and would not eat nor drink until he died of grief. Once he heard the story, Barata became miserable and very angry with his mother. He and Rama remained friends, and he refused to accept the throne; but Rama would not break his father's promise and went to live in the deep forests together with Sita and his younger brother, Lakshaman. Barata accepted the throne, but vowed to kill himself after fourteen years, if Rama did not return to retrieve it. In Lanka, King Ravana heard of Sita. He was told that she was more beautiful than Uma, the Queen of the Universe, and Suraswadee, the Queen of Love, and even Lakshami, the consort of Narayana. So he decided to seize her. For the purpose, he went to the forest together with one of his men, Mareet. They went near the place where Rama lived with his wife and his brother. Now, Mareet transformed himself into a beautiful golden deer. Rama went hunting for the deer, while his brother guarded Sita. Mareet led Rama far away, and then he cried out for help with the voice of Rama. Lakshaman heard the cry and left Sita to join Rama. Now, Ravana transformed himself into a hermit and approached Sita. With false words he tried to lure her to leave Rama, but when she refused, Ravana shifted back to his true shape and abducted her and flew away with her towards Lanka. On the way, they were seen by Sadayu, the king of birds and a friend of Rama. Sadayu attacked Ravana in the air, but Ravana took a magic ring from Sita's finger and threw it at Sadayu, who fell to the ground, mortally wounded. Before he died, however, Sadayu told Rama and his brother what had happened to Sita, and he gave Sita's ring back to Rama. Meanwhile, Ravana had brought Sita to Lanka and ordered his thousand sons to guard her. Rama and Lakshaman immediately set out in search of Lanka to retrieve Sita. On their way, they met Hanuman, the white monkey. Hanuman was born as the son of a princess, Nang Savaha, and the Wind God. Nang Savaha was the half-sister of the monkey kings, Palee, the green monkey, and Sugriva, the red monkey, so Hanuman was their nephew. Hanuman inherited his father's strength and magical powers. He was educated by Shiva, who made him invincible and invulnerable and taught him how to transform himself and make himself invisible. Hanuman's mother had told him to join Rama, and so he did. He advised Rama against proceeding towards Lanka on his own, because the route was difficult, and the demons numerous and fierce. They would need a powerful army to succeed. They agreed, and Hanuman mobilised support from friendly kings, including the monkey army of King Sugriva. When his forces were ready, Rama instructed Hanuman to go in advance to find the way to Lanka and to carry a message for Sita. Rama gave Hanuman Sita's ring, and told him the secret about how he and Sita first met, so that Sita could know for sure that Hanuman was his envoy. Hanuman reached Lanka after many violent and romantic adventures. He found Sita, who was just about to hang herself, and identified himself, and gave her the message from Rama. Hanuman suggested that he simply carried Sita back to Rama, but she refused, because she found it inappropriate to be abducted by a demon and carried back by a monkey. Before he left Lanka, Hanuman killed the thousand sons of Ravana and set the city on fire. He went back to Rama, who was annoyed with such violence, because he feared for the safety of Sita. Rama immediately went off towards Lanka with his army of monkey soldiers. To take his army to Lanka, Rama had to build a causeway across a strait. King Sugriva and his monkey army began the work, assisted by Hanuman. But King Ravana interfered. He ordered his mermaid daughter to assemble all the fish to spoil the construction. So as rocks and stones were thrown into the sea, they were immediately removed by the fish. Fighting the fish, Hanuman realised that they were acting under orders of the mermaid. She was beautiful, and Hanuman won her love. She ordered the fish to take the stones back, and later, she gave birth to a boy, who was half monkey and half fish. When the boy grew up, he went to live in a pond in front of the palace of a giant, serving as a guard. Meanwhile, King Ravana re-built his capital which had been burnt down by Hanuman. The new town was even more splendid than the old one. One night, he had a strange dream: A white vulture came from the east and attacked a black vulture coming from the west. The black vulture was killed and fell to the ground, next to a demon who held an oil lamp made of a coconut shell. The lamp burned until all the oil was gone. Then the fire spread to the demon and burned him to ashes. Highly concerned, Ravana asked advice from his younger brother, Bhibek, who was the royal astrologer. Bhibek told him that the black vulture was himself and the white vulture Rama, and that the dream predicted that Rama would defeat him and destroy Lanka. The only way to prevent this disaster would be to release Sita and send her back. But Ravana would hear of no such thing; he went furious, and confiscated the property and the wife and children of Bhibek, and sent him into exile. Having nowhere else to go, Bhibek went to serve Rama as an adviser. Ravana summoned Bhibek's daughter, Benjakai. He ordered her to transform herself into the dead body of Sita, to be found by Rama, in order to deceive him to go back. Benjakai carefully studied the face and the body of Sita and transformed herself to resemble her accurately. She went to the river and floated away and drifted across the sea to the river bank where Rama was having a bath. Rama and his brother found her and were miserable, because they thought that Sita was dead. But Hanuman suspected a ruse. They put the body on a cremation fire, and hereby, Benjakai was transformed back to her own appearance. She tried to fly away but was caught by monkey soldiers. Rama realised that she had acted under force and ordered Hanuman to take her back to Lanka, but she was beautiful, and Hanuman, always attracted by beautiful ladies, won her love before they departed. Later, she gave birth to a son who was half demon and half monkey. When Rama's army had arrived in Lanka, he set up his camp in Emerald Hills. He sent Ongkot as a messenger to Ravana. Ongkot was a powerful green monkey and a nephew of King Sugriva. He forced his way onto Ravana's palace and read him a message from Rama, who threatened to destroy Lanka unless Sita was set free. Ravana got furious and attacked Ongkot, but without success. Ravana sent an army led by his brother Kumprakarn, and Rama sent his monkey army led by King Sugriva. They fought hard, but none of them could defeat the other. In second battle, Kumprakarn was met by an army led by Rama's brother, Lakshaman. 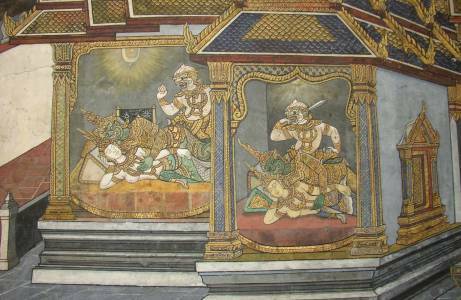 At the end of the day, the demons were losing, but Kumprakarn hit Lakshaman with a magic spear, so the demons could retreat into the city, while Lakshaman was mortally wounded. Bhibek knew about the spear. Lakshaman could only be saved by a potion made by two magic herbs and water from five rivers, and the medicine must be applied before sunrise. To win time, Hanuman went to request the Sun to stop moving. This was not possible, but the Sun promised to rise behind clouds, leaving time for Hanuman to collect the herbs and the water, and Lakshaman was saved. A third battle ensued. This time, Rama himself went to meet Kumprakarn, whom he defeated and killed. Having lost his brother, Ravana then turned to his son, Intarachit, to take command. Intarachit was regarded as invincible. In a first battle, he attacked with magic arrows that turned into serpents. Lakshaman and all the monkey soldiers became entangled in thousands of serpents and fell to the ground. Intarachit went back into the city, convinced of his victory. Rama, however, at the advice of Bhibek, summoned Phaya Subanraj, the Garuda King, who swept down from the sky and frightened the serpents to retreat underground. Hereby, Lakshaman and his soldiers were released. In a second battle, Intarachit transformed himself into the shape of Indra, riding the multi-headed elephant Erawan, and he transformed all his soldiers into dancing angels. The sight stupefied Lakshaman and his soldiers, and Intarachit hit them with arrows that rendered them unconscious. Once again, however, they were saved by magic drugs prescribed by Bhibek and provided by Hanuman. In a final battle, Intarachit was killed by Lakshaman. Now, Ravana became fierce with rage. He wanted to kill Sita, but was persuaded against it, as it would be below his dignity to kill a defenceless woman. Then he went himself to fight Rama. They fought all day, and he saw the power of Rama and his army. By nightfall, he had to retreat back to the city. Ravana summoned his friends, the demon King Mulapalam and his brother Sahasdeja, and Ravana's nephew, Saeng-Atit, but all were defeated and killed by Lakshaman and Hanuman. Once again, Ravana went into battle himself, and was met by Rama and Lakshaman, who destroyed all his magic weapons. He was shot by an arrow through the heart, but was not killed, because his soul had been removed from his body, so he was able to pull the arrow out and retreat to the city. Ravana now summoned several extremely powerful allies, including his two elephant sons, who were sent to fight Rama, but who were all destroyed. Ravana decided to bring his case to Maleevaraj the Just, his grandfather, who resided at the top of a hill in heaven. Because of his infallible justice he had the power that everything he said must happen. Maleevaraj listened to the envoys of Ravana, but he also summoned Rama and Lakshaman to question them. Afterwards, he sent for Sita to hear her story, and he called in the gods as witnesses. Being fully informed, he told Ravana to give Sita back to Rama. When Ravana refused, Maleevaraj predicted his defeat and death. Ravana then decided to carry out a particular ceremony that would make him able to finally win the war. The ceremony involved the consecration of his famous spear and the destruction of images of all the gods who sided with Rama. But Shiva saw the ceremony with his magic eyes and sent Palee to interrupt it. Ravana realised that all that he did was known by the enemy, and he believed that Bhibek was the one to blame. On the next day's fighting, he aimed his spear towards Bhibek, who fought next to Lakshaman, and the spear hit Lakshaman and not Bhibek. One more time, however, Lakshaman was saved by a potion known by Bhibek and with ingredients that were speedily provided by Hanuman. During the next day's fighting, Rama cut Ravana with his sword several times, but Ravana did not die. Rama asked Bhibek why it could be so, and Bhibek explained that Ravana's soul was kept apart from his body, in the custody of his old teacher, the hermit Kobut. Rama then sent Hanuman and Ongkot, the green monkey, to retrieve Ravana's soul from the hermit. Hanuman and Ongkot could not disguise themselves for this occasion, because the wise hermit would find out immediately. Instead, they pretended to have shifted their loyalty from Rama to Ravana. The hermit brought them into the city of Lanka, bringing along the shrine with Ravana's soul. Hanuman joined the service of Ravana, while Ongkot got away with the shrine, replacing it with a similar one. Hanuman fought fiercely against his former monkey allies, to the delight of Ravana. The next day, Ravana decided to join him in the fight. Ongkot brought the shrine with Ravana's soul to Hanuman, who showed it to Ravana. Now Ravana knew that he had been deceived and defeated. In the evening, he took leave of his wife and his consorts, and all the demons mourned his upcoming defeat. On the following day, Ravana resumed the fighting, because he wanted to die like a king. Once again, he appeared in the shape of Indra. Rama shot him with an arrow, while Hanuman crushed the shrine with his soul, and so he died. He was mourned by Bhibek, his brother, and by his wife and all his consorts. Upon the final victory, and after so many years, Sita was hesitant to meet Rama. She wanted to prove her chastity by walking on fire, and called all the gods as witnesses. Palee made up a big fire, and as Sita walked across it, lotus blossoms sprouted below her feet and protected her. Rama was deeply impressed. Rama installed Bhibek as the new ruler of Lanka, and departed with his army. On his way back, he removed the causeway that he had built. He arrived in Ayudhya after exactly fourteen years, just in time to prevent his half-brother Barata from killing himself. Rama was crowned as the new King of Ayudhya. He rewarded all who had helped him, and appointed many of his allies as rulers of various cities and outposts. Hanuman was not happy with ruling and went to live as a hermit for a while. In the time to come, there was still some fighting between Rama and the former allies of Ravana. Hanuman participated in the fighting and found an opportunity to visit his old love, Benjakai, who still lived in Lanka. There was a female demon ghost, a distant relative of Ravana, who wanted to take revenge for the defeat of Lanka. This ghost took the shape of a maid servant and went into the service of Sita. One day, when Rama was away in the forest, the ghost asked Sita to draw a picture of the fierce Ravana, to show what he looked like. Sita did so, but then she realised that the slate was enchanted, so the picture could not be erased. Rama came back, and found the slate with Ravana's image. He got furious, because he thought that Sita's heart was with Ravana, and he ordered Lakshaman to take Sita away and execute her. Lakshaman took Sita to the forest and released her. He killed a stag and took its heart to Rama to show, pretending that it was Sita's own heart. Sita went to live with a hermit. She was pregnant and gave birth to a son. When she went out to find food, she left the son in the care of the hermit. She met a she-monkey with two little baby monkeys, one clinging to her back and one to her front. As one mother to another, Sita blamed the monkey for carrying her children with her, as it could expose them to all kinds of danger. But the she-monkey replied that Sita was the more careless one, leaving her boy behind in the care of an old hermit who spent his time meditating with closed eyes. Sita realised that the monkey was right, and she went back to fetch her son. The hermit was praying and did not notice, but later, he saw that the little boy was not there, and he became very unhappy. He started a fire ceremony to create an exact replica of the son. While he was doing so, Sita came back, and the hermit was happy to learn that the son was safe. Sita persuaded him to carry on with the ceremony, and he created another son. The two boys were named Mongkut and Lob. They grew up together, and the hermit served as their teacher. One day, the two boys were practising arms in the forest. They made a lot of noise, which was heard by Rama, and which annoyed him. He sent out a royal horse with orders that the one who was making the noise should make himself known and surrender. But Mongkut and Lob didn't care. Instead, they caught the horse and rode about on its back. When Hanuman came to interfere, they tied him up, and cast a spell on him so that he could be untied only by Rama himself. Rama now sent his brothers to seize the culprits. A lengthy battle ensued, and Mongkut was brought back to Ayudhya as a prisoner, while Lob escaped. Shortly after, Lob was able to free Mongkut, using Sita's magic ring. Rama, highly angry, went with an army to catch the two boys. In a long fight, he was unable to defeat them, because the arrows they shot against each other turned into flowers and food. Rama wondered about this, and asked the boys who they were. They replied that Sita was their mother and they had no father. Rama was delighted to learn that Sita was still alive, and realised that the boys must be his own sons. He went to her hut to take her back. She strictly refused, but it was agreed that the boys could go to live with their father. Rama tried several ways to lure Sita to come back, but to no avail. Eventually, he asked Bhibek for advice. Bhibek told him that he had to leave the kingdom for twelve months before Sita would change her mind. So Rama went into the forest together with Lakshaman and Hanuman. They were joined by Sugriva and his monkey soldiers and spent the twelve months fighting the demons. In Heaven, Indra and Shiva were concerned about the quarrel between Rama and Sita and summoned them for a council. They were reminded that they had been sent by the gods to restore peace, and that the Earth could not be happy as long as the two were at odds with each other. Rama admitted that he had been wrong to Sita and had been misguided by jealous passion. Shiva directed them to restore their relation and return to the Earth together to live in harmony. In this way, peace and unity reigned once again.